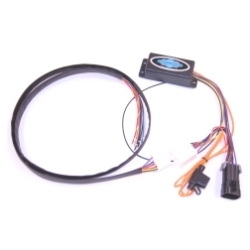 Our Indian Illuminator Module is designed to provide you running light, brake light and turn signal functions to each rear turn signal once the AMBER LED’s and lenses have been replaced with RED versions. The built-in Load Equalizer prevents a “rapid-flash” which occurs when factory turn signals are removed. When using this module, you must use our RED LED/lens kit to comply with DOT regulations. Any other turn signal WILL CAUSE DAMAGE to the module that IS NOT covered under warranty.